Sonny is very quiet and serious looking but in reality he is pretty smart and quick on his feet. Thanks to his new eye, he is able to target people easier and coordinates his robotic eye with his robotic hand as a combat strength. Originally he came to void to look for an Android named Fatima. Fatima was made by a mysterious group and were responsible for an attack made in Sonny's home city that left his heavily scarred and missing limbs. In return for spending millions on an inner city kid's body, he promised to look for her but after several years, he's made ZERO progress. 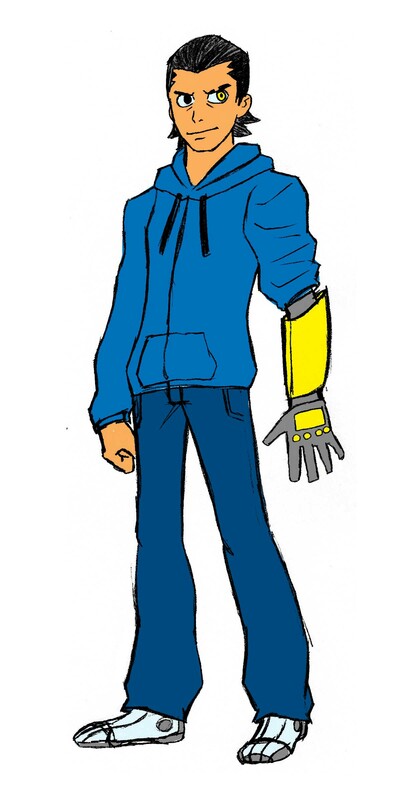 He's met many characters in void and was trained by Arena, Leland and many others in hopes that he can be prepared for his reunion but Sonny is starting to suspect that maybe there never was an android to begin with. I mean seriously, why would they give a ghetto Hispanic kid cybernetic parts and tell him to visit a city such as void without supervision? The corporation that worked on him haven't even bothered calling him for a follow up? He meets Mr. Awesome, pisses his pants. Leland, David Birch and others not only replace it with one that runs on Nano Machines but give him a whole muscle suit in case of emergency. Leland tries to teach Sonny magic by explaining to him that all magic, ki, chakra, ect is based off having BELIEFS that are so strong that the universe will bend its will to making the illusion real. Consequently, Sonny develops a strong DISBELIEF in magic, therefore making him immune. Once Arena beats Bako and becomes a VCPD officer, Sonny takes off and finds work with Dr. Fabulous at his hotel as the man in charge of cleaning an abandoned floor filled with overpriced Luxurious suites. Look at Lou Diamond Philips in both "La Bamba" and "Stand and Deliver"